Ackerman, J. 1998. Dinosaurs take wing. New fossil finds from China provide clues to the origin of birds. National Geographic 194 (July):74-99. Brush, A. H. 1996. On the origin of feathers. Journal of Evolutionary Biology 9:131-142. Chatterjee, S. 1997. The Rise of Birds. Johns Hopkins Press, Baltimore. Chiappe, L. M. 1995. Late Cretaceous birds of southern South America: Anatomy and systematics of Enantiornithes and Patagopteryx deferrariisi. Münchner Geowissenschaftliche Abhandlungen 30:203-244. Chiappe, L. M., S. A. Ji, Q. Ji, and M. A. Norell. 1999. Anatomy and systematics of the Confuciusornithidae (Theropoda: Aves) from the late mesozoic of northeastern China. Bulletin of the American Museum of Natural History 242:3-89. Clarke, J. A. and M. A. Norell. 2002. The morphology and phylogenetic position of Apsaravis ukhaana from the Late Cretaceous of Mongolia. American Museum Novitates 3387:1–46. Dingus, L. and T. Rowe. 1997. The Mistaken Extinction: Dinosaur Evolution and the Origin of Birds. W.H. Freeman and Co., New York. Elzanowski, A. and P. Wellnhofer. 1996. Cranial morphology of Archaeopteryx: Evidence from the seventh skeleton. Journal of Vertebrate Paleontology 16:81-94. Forster, C. A., L. M. Chiappe, D. W. Krause, and S. D. Sampson. 1996. The first Cretaceous bird from Madagascar. Nature 382:532-534. Garner, J. P., G. K. Taylor, and A. L. R. Thomas. 1999. On the origins of birds: the sequence of character acquisition in the evolution of avian flight. Proceedings of the Royal Society of London Series B 266:1259-1266. Gatesy, S. M. and K. P. Dial. 1996. 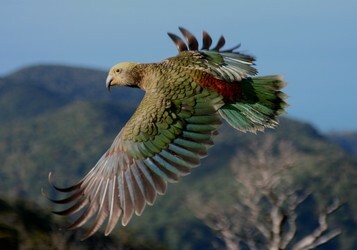 Locomotor modules and the evolution of avian flight. Evolution 50:331-340. Gatesy, S. M. and K. P. Dial. 1996. 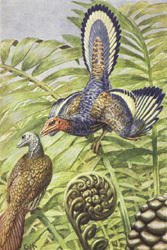 From frond to fan: Archaeopteryx and the evolution of short-tailed birds. Evolution 50:2037-2048. Heilmann, G. 1926. The Origin of Birds. H. F. & G. Witherby, London. Hou, L. H., L. D. Martin, Z. H. Zhou, and A. Feduccia. 1996. Early adaptive radiation of birds: Evidence from fossils from northeastern China. Science 274:1164-1167. Hou, L. H., L. D. Martin, Z. H. Zhou, A. Feduccia, and F. C. Zhang. 1999. A diapsid skull in a new species of the primitive bird Confuciusornis. Nature 399:679-682. Hou, L. H., Z. H. Zhou, L. D. Martin, and A. Feduccia. 1995. A beaked bird from the Jurassic of China. Nature 377:616-618. Novas, F. E. and P. F. Puerta. 1997. 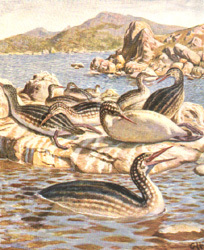 New evidence concerning avian origins from the Late Cretaceous of Patagonia. Nature 387:390-392. Padian, K. 1998. When is a bird not a bird? Nature 393:729-730. Padian, K. and L. M. Chiappe. 1998. The origin of birds and their flight. Scientific American 278:38-47. Prum, R. O. 1999. Development and evolutionary origin of feathers. Journal of Experimental Zoology 285:291-306. Sanz, J. L., L. M. Chiappe, B. P. Perez-Moreno, A. D. Buscalioni, J. J. Moratalla, F. Ortega, and F. J. Poyato-Ariza. 1996. An Early Cretaceous bird from Spain and its implications for the evolution of avian flight. Nature 382:442-445. Sanz, J. L., L. M. Chiappe, B. P. Perez-Moreno, J. J. Moratalla, F. Hernandez-Carrasquilla, A. D. Buscalioni, F. Ortega, F. J. Poyato-Ariza, D. Rasskin-Gutman, and X. Martinez-Delclos. 1997. A nestling bird from the Lower Cretaceous of Spain: Implications for avian skull and neck evolution. Science 276:1543-1546. Sereno, P. C. and C. G. Rao. 1992. Early evolution of avian flight and perching - new evidence from the Lower Cretaceous of China. Science 255:845-848. Shipman, P. 1998. Taking Wing. Archaeopteryx and the Evolution of Bird Flight. Simon & Schuster, New York. Swisher, C. C., Y. Q. Wang, X. L. Wang, X. Xu, and Y. Wang. 1999. Cretaceous age for the feathered dinosaurs of Liaoning, China. Nature 400:58-61. Zhang, F. and Z. Zhou. 2000. A primitive enantiornithine bird and the origin of feathers. Science 290:1955-1959. Assembling the Tree of Life: Early Bird. A large-scale, cooperative effort among five institutions in the U.S., one in Scotland, and two in Australia to determine the evolutionary relationships among all major groups of birds. Aves: Fossil Record. UCMP Berkeley. All About Archaeopteryx. Talk.Origins Archive. The Archaeopteryx Pages. Maintained by Ilja Nieuwland. Discovery Of Earliest-Known Fossil-Bird Hatchling Gives Insight Into The Evolution Of Birds. News release about the discovery of a Lower Cretaceous enantiornithine nestling from Spain (Sanz et al. 1997). New Sickle-Clawed Fossil from Madagascar Links Birds and Dinosaurs. Information about the discovery of Rahona ostromi (Forster et al. 1998). NSF News. Jeff Poling's Journal of Dinosaur Paleontology has numerous articles about Archaeopteryx, Ancient Birds, and Dinosaur-Bird Relationships. For additional web resources on the phylogenetic position of birds consult the Information on the Internet section on the Coelurosauria page. From Heilmann, G. 1926. The Origin of Birds. H. F. & G. Witherby, London.